With winter just around the corner, we’re already seeing a few storms coming through. Do you know what to do if a storm puts a hole through your roof? 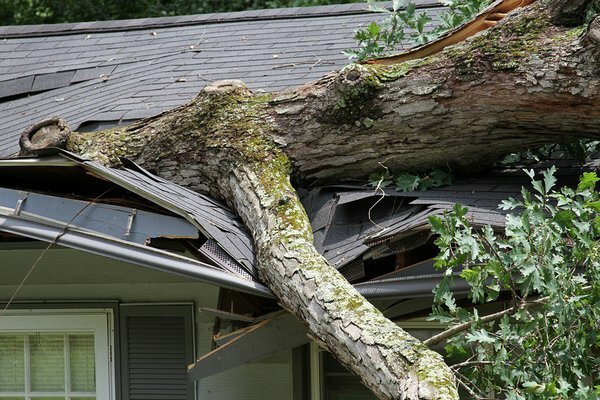 When your roof is damaged by storms, or if a tree crashes through your ceiling, you’ll need a quick fix to keep you and your family safe and warm until you can work with your insurance company and local roof repair business to fix the damage. Roll one end of the tarp twice around one wood strip and tightly screw it into the undamaged side of the roof. Roll the rest of the tarp up over the ridge of the roof and down the other side, covering the damage and extending several feet past it. Roll the end of the tarp around the second wood strip and screw the wood into the roof, roll side down. Use the rest of your wood strips to hold down tarp’s sides by screwing them into the roof as well – these do not have to be rolled. This quickie roof repair won’t do much for insulation, but it should keep you dry until a professional can come out.